OK... now this is California so they had a Farmers Festival. As part of it they had a Farmers Daughter contest. They were judged by competitions such as tractor driving, goat milking, sewing and cooking activities and a mystery contest. Yet, just to be named a finalist, these young women already had to depend on their poise and speaking abilities to impress judges and use their writing skills to complete an essay outlining why they want to become the Farmer’s Daughter. Hmmm .. Wonder HOW they impressed the judges.. 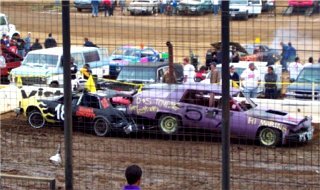 Kill Bin Laden Of course one of the activities they have at a Farmers Festival is a Demolition Derby. I mean don't all farmers do that? 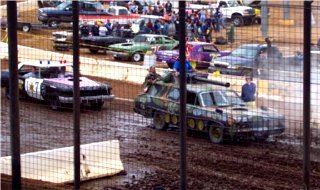 A demolition derby is kind of like rush hour on the 405 here. 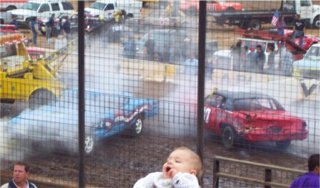 I think they use the demolition derby for driver education here. One of the themes seemed to be directed towards Osama Bin Laden. If you look on the front of this car it says Kill Bin Laden and the crowd liked that idea. Look at all the work this guy did to this car to do nothing but smash it up. Bin Laden in Trunk And here is another. 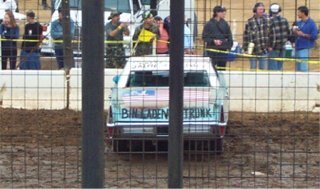 Across the trunk it says Bin Laden in Trunk. 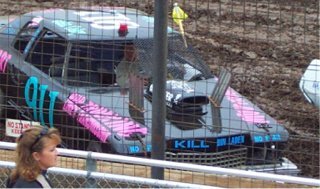 If you have never been to a demolition derby the idea is to protect your front end where the radiator is cause if your radiator gets blown your engine will overheat pretty quickly. So, this guys idea was if Bin Laden was in the trunk everyone would hit him in the back end. Tank I don't remember the name of this vehicle but it had something to do with hunting down Bin Laden. The crowd loved it. Even the ones that had teeth. Rush Hour on the 10 Here is a shot of rush hour on the 10. 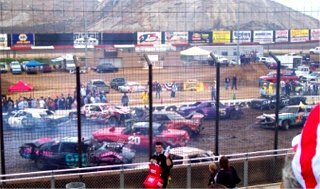 In fact just a few days before I was at the festival there was a 54 car pile up near Perris on the 215. When they do accidents in California they do them right.... it looked even worse then this.